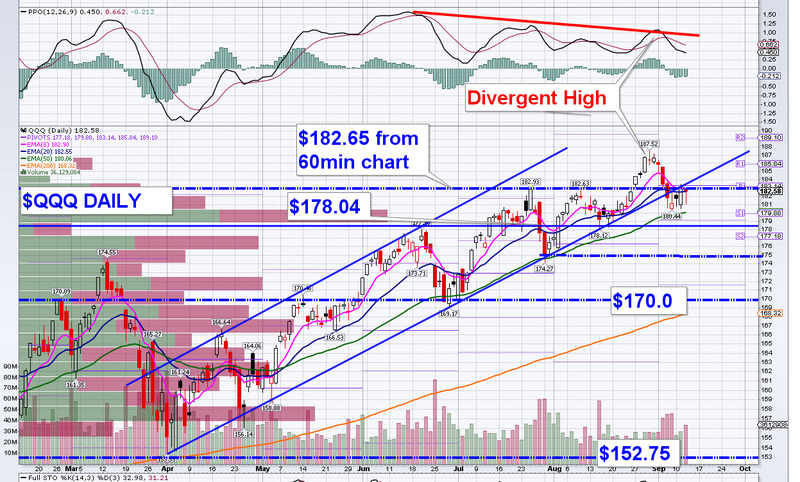 The article gives the stock market key levels for SPY, QQQ, and IWM with commentary for each index. Although much has been happening under the hood, SPY itself has been grinding within a narrow $2 range for 6 trading days. Today things were looking weak in early trading until news of new trade talks with China jacked the market to the top of the trading range which has been capped at $289.50. The bottom line for me is this…. a solid hourly close above $289.50 put the bulls back in control and I’d expect a run toward the highs. If traders fade today’s move and drop price below the blue box, I expect yet another re-test of $287.50. Below $287.50 the bears will get emboldened. Recently the semiconductor and social media sectors have been playing havoc on tech. For now though the damage has been contained relatively speaking. That said, the Q’s are in a precarious technical position. Price has dropped below the well-defined uptrend that has been in place from the April lows and below the breakout level of $182.65. We’ve been back-testing that area for several days. 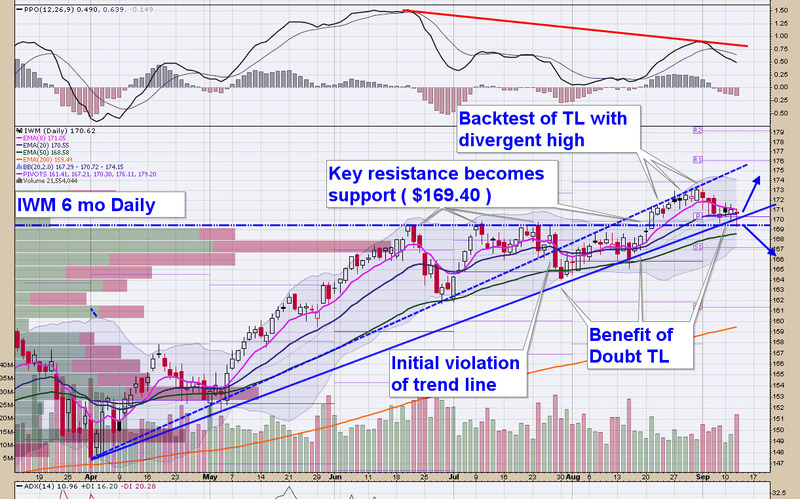 To my eye, a recapture of $182.65 and the uptrend line put the bulls in control. On the downside, the first test is $180. Below that the door is open to $178. Because of the stock weightings, the outcome of QQQ will boil down to FAAMG. Facebook, Amazon, Apple, Microsoft, and Google. Today, Facebook was weak and the reaction to the Apple event was less than stellar. For what it’s worth, I think SPY follows the QQQ’s, what ever direction that may be. IWM is also testing a key level. After breaking its uptrend line from April, price has been back-testing that line for a couple weeks before backing away. For me, $169.40 is the key. Above that, bulls stay in control. 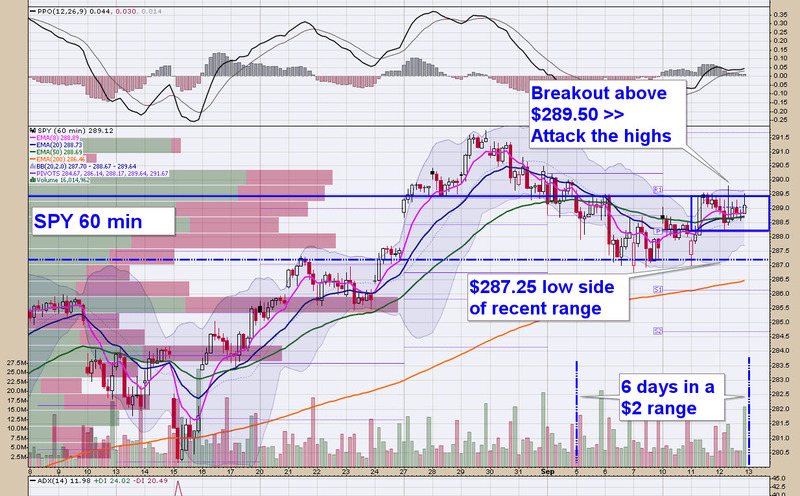 Below that level, the action of the past 2 weeks or so amounts to a failed breakout which is bearish. Maybe it’s just me, but it feels like the market is on a knife edge. Price is dancing on keys spots across all the indexes. That is a little unusual. Will tech save the day or roll over? Stay tuned!!! 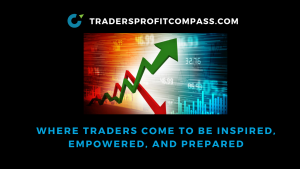 Whether you lean bullish or bearish go in with your eyes wide open and a plan. Let price do the talking and adjust your posture as needed.